The College of Southern Maryland (CSM) inducted 15 nursing students into Alpha Omega, CSM’s chapter of the Organization for Associate Degree Nursing (OADN) Alpha Delta Nu Honor Society on Jan. 23. “Admission into an honor society is an extraordinary accomplishment and is a recognition of years of hard work and dedication,” Nursing Professor Dr. Karen Russell told the honorees during their induction and pinning ceremony. Russell and Nursing Professor Lynn Kennedy serve as faculty advisers for CSM’s Alpha Omega Chapter of Alpha Delta Nu. Russell told the audience that the focus of healthcare is shifting from disease treatment and management to health promotion and disease prevention. As a result, she pointed out, nurses today have the opportunity to work in a multitude of practice settings. To be inducted into CSM’s Alpha Omega Chapter, nursing students must first become provisional members in their third semester of the program. The student must maintain a 3.0 GPA, earn a B or higher in all courses required for the nursing program with no previous nursing course failures and reflect sound moral and ethical values with professionalism and integrity of the highest caliber. Additionally, the new inductees complete a service learning project and reflect on that project. 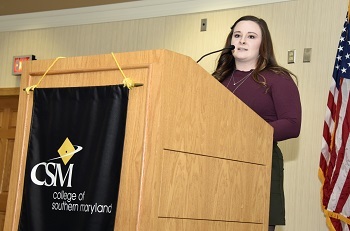 “This [induction] is just a small stepping stone on our way to graduation and I know I’m speaking for everyone when I say it’s such an awesome feeling knowing that we worked so hard to get where we are today,” said Kayla Getgen, vice president of CSM’s Alpha Omega Chapter. “I challenge each of you to think of this induction into the honor society as a beginning, not an end,” Russell added. “It is the beginning of your continuous pursuit of knowledge, of lifelong learning. It is the beginning of thinking differently about yourself. 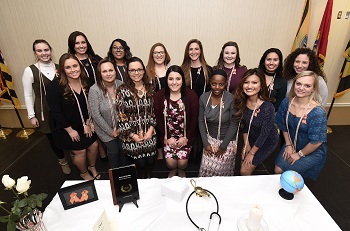 CSM nursing students are inducted into Alpha Omega, CSM’s chapter of the Organization of Associate Degree Nursing (OADN) Alpha Delta Nu Honor Society. From left in the front row are Kasey Long, Miranda Martin, Angela Middleton, Caitlin Nutter, Terrice Stewart, Leslie Thompson and Brittany Vallandingham. In the back row from left are Molly Abell, Hannah Aley, Jasmine Dyson. Abbie Everly, Jessica Fantaccione, Kayla Getgen, Jacquelyn Guadalajara and Kristina Guzzardo. For more information on CSM’s nursing program, visit www.csmd.edu/nursing. To view photos from the event, visit https://csmphoto.zenfolio.com/19janadninduction.